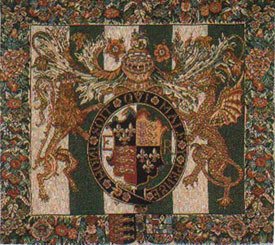 History : This tapestry, known as the "Great Yarmouth Cloth of Estate" can be attributed to the Enghien weaver Jan Mostinck in 1539, who was claimed to be the "tapissier" to the Royal Court of England. The original of this tapestry belongs to the "Burrell Collection" in Glasgow and represents either the reign of Eduard VI (1547-1553) or Elisabeth I (1559-1603). 50" x 56" made of 70% wool, 30% cotton.